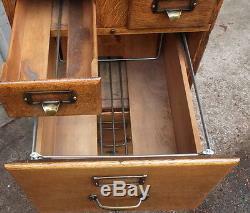 This is a great old oak file cabinet. 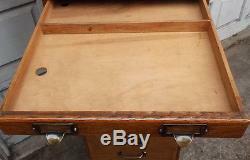 It is a 16 drawer file cabinet made by the Shaw Walker Furniture Co. It is a five section 7 piece stacking cabinet that has 2 larger files on the bottom that are standard size, a 2 drawer section in the middle for small file cards and 2, six drawer sections on the top for maps or prints, also a top and base. There are five rods that hold it all together when stacked in the position you desire. 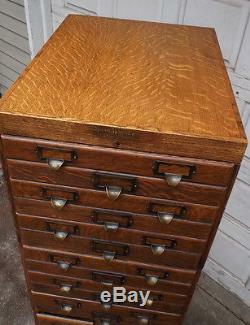 The finish is in very good condition and the top is marked Shaw Walker, the bottom 2 drawers have a center rod that is marked S over W on the outside. 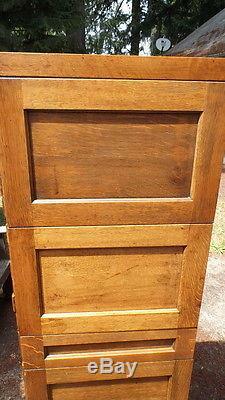 The cabinet is fairly tall measuring 60 inches tall, 16 inches wide and 19 inches deep. The item "Antique 16 Drawer Stacking Oak File Cabinet Shaw Walker -Mission" is in sale since Thursday, July 07, 2016. 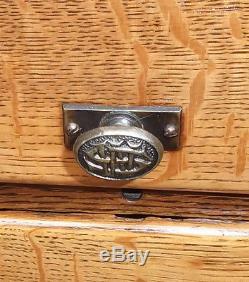 This item is in the category "Antiques\Furniture\Cabinets & Cupboards\1900-1950".hunter" and is located in Portland, Oregon. This item can be shipped to United States.